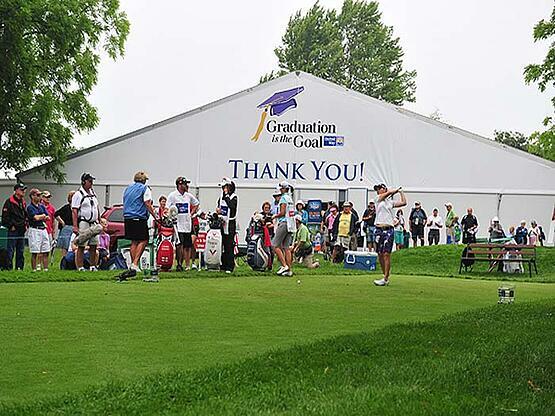 Tournament officials contacted Mahaffey Fabric Structures after their previous special event vendor declared bankruptcy. They wanted Mahaffey to provide the structures for their LPGA golf tournament that benefits disabled children and inner city youths. The competition is sponsored by Wegman’s Grocery Stores, and is held in June at Locust Hill – a private country club in Rochester, New York. For this elite event, coordinators demanded pristine and elegant structures with innovative features. Mahaffey’s nine-man crew spent almost three weeks working on the set up. Installation was only part of the job. Along with over 51,000 square feet of structures, the crew laid over 44,000 square feet of new modular wood flooring. Additional deck flooring was supplied and ramps were built. But the construction did not end there. Gutters were added, platforms built, and walkways were installed. Throughout the set up, special consideration had to be taken of the grounds and of the club members’ golf schedules. Each stage of construction was planned and carried out on specific days and times so as not to interrupt the daily routine of the club and its members. Site accessibility for vehicles was extremely limited, because the condition of the turf had to be maintained. To achieve the custom look that the client was seeking, 206 clear glass window panels were installed to give spectators a perfect view of the grounds. Double glass doors were added to complement the window panels. Eleven 28-light chandeliers attached to dimmer switches were installed to add elegance. Clear gable ends allowed natural lighting to be viewed from inside the tent. Traditional accessories such as hard sides, arched window walls, and white ceiling liners were also used. To complete the look, landscaping was added that enhanced each structure’s feeling of permanence. 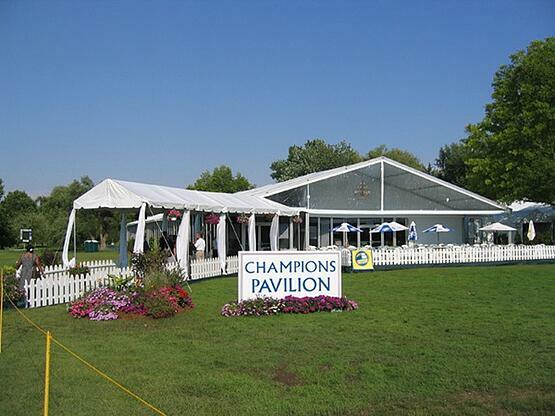 The Champions Hospitality Pavilion itself was over 10,000 square feet! Measuring an impressive 66’ x 164’ and containing clear gables and chandeliers, the Hospitality Pavilion was surpassed only by the Expo structure that measured over 13,000 square feet and contained white hard sides. Guests were treated to comfort and style, while the Expo vendors reveled in the ample space available for their products. Many structures were raised for the event, including structures for merchandising, corporate sponsors, press boxes, catering areas, and a “Sports Zone.” With custom designed and fabricated walls and accessories, each structure had the sumptuous feel that the customer envisioned. Guests, media, and players alike enjoyed the ambiance of relaxed elegance and comfort, while most importantly, the tournament raised money for a worthy cause – a children’s charity. Interested in learning more about Mahaffey's clear span solutions for entertainment and events, or want to speak with an event specialists today?